The City of London Corporation, officially and legally the Mayor and Commonalty and Citizens of the City of London, is the municipal governing body of the City of London, the historic centre of London and the location of much of the United Kingdom's financial sector. In 2006 the name was changed from Corporation of London to avoid confusion with the wider London local government, the Greater London Authority. Both businesses and residents of the City, or "Square Mile", are entitled to vote in elections, and in addition to its functions as the local authority – analogous to those undertaken by the 32 boroughs that administer the rest of the Greater London region – it takes responsibility for supporting the financial services industry and representing its interests. The corporation's structure includes the Lord Mayor, the Court of Aldermen, the Court of Common Council, and the Freemen and Livery of the City. The rights and privileges of the City of London are enshrined in the Magna Carta’s clause 9 - as enumerated in 1297 - and, along with clauses 1 and 29, it remains in statute. In Anglo-Saxon times, consultation between the City's rulers and its citizens took place at the Folkmoot. Administration and judicial processes were conducted at the Court of Husting and the non-legal part of the court's work evolved into the Court of Aldermen. There is no surviving record of a charter first establishing the Corporation as a legal body, but the City is regarded as incorporated by prescription, meaning that the law presumes it to have been incorporated because it has for so long been regarded as such (e.g. Magna Carta states that "the City of London shall have/enjoy its ancient liberties"). The City of London Corporation has been granted various special privileges since the Norman Conquest, and the Corporation's first recorded Royal Charter dates from around 1067, when William the Conqueror granted the citizens of London a charter confirming the rights and privileges that they had enjoyed since the time of Edward the Confessor. Numerous subsequent Royal Charters over the centuries confirmed and extended the citizens' rights. Around 1189, the City gained the right to have its own mayor, later being advanced to the degree and style of Lord Mayor of London. Over time, the Court of Aldermen sought increasing help from the City's commoners and this was eventually recognised with commoners being represented by the Court of Common Council, known by that name since at least as far back as 1376. The earliest records of the business habits of the City's Chamberlains and Common Clerks, and the proceedings of the Courts of Common Council and Aldermen, begin in 1275, and are recorded in fifty volumes known as the Letter-Books of the City of London. The City of London Corporation had its privileges stripped by a writ quo warranto under Charles II in 1683, but they were later restored and confirmed by Act of Parliament under William III and Mary II in 1690, after the Glorious Revolution. With growing demands on the Corporation and a corresponding need to raise local taxes from the commoners, the Common Council grew in importance and has been the principal governing body of the City of London since the 18th century. In January 1898, the Common Council gained the full right to collect local rates when the City of London Sewers Act 1897 transferred the powers and duties of the Commissioners of Sewers of the City of London to the Corporation. A separate Commission of Sewers was created for the City of London after the Great Fire in 1666, and as well as the construction of drains it had responsibility for the prevention of flooding; paving, cleaning and lighting the City of London's streets; and churchyards and burials. The individual commissioners were previously nominated by the Corporation, but it was a separate body. The Corporation had earlier limited rating powers in relation to raising funds for the City of London Police, as well as the militia rate and some rates in relation to the general requirements of the Corporation. The Corporation is unique among British local authorities for its continuous legal existence over many centuries, and for having the power to alter its own constitution, which is done by an Act of Common Council. Local government legislation often makes special provision for the City to be treated as a London borough and for the Common Council to act as a local authority. The Corporation does not have general authority over the Middle Temple and the Inner Temple, two of the Inns of Court adjoining the west of the City which are historic extra-parochial areas, but many statutory functions of the Corporation are extended into these two areas. The Chief Executive of the administrative side of the Corporation holds the ancient office of Town Clerk of London. The Town Clerk, who is also the Chief Executive. The Chamberlain, the City Treasurer and Finance Officer. The City Remembrancer, who is responsible for protocol, ceremonial, security issues as well as legislative matters that may affect the Corporation and is legally qualified (usually a Barrister). The City Surveyor, provides guidance to combine the fund management of a major central London commercial property portfolio extending to over 16 million square feet of space, with the management of the City’s 600 operational properties stretching across Greater London, including Guildhall, The Mansion House, and Central Criminal Court (Old Bailey). The Comptroller and City Solicitor; legal officer. The Recorder of London, the senior judge at the Central Criminal Court 'Old Bailey' who is technically a member of the Court of Aldermen; but without precedence, he processes between the senior Aldermen, i.e. former Lord Mayors, and the junior Aldermen. The Common Serjeant, the second senior judge at the Central Criminal Court 'Old Bailey', technically the legal adviser to the Common Council (i.e., Serjeant at Law to the Commoners). The three Esquires at the Mansion House: The City Marshall, the Sword Bearer and the Mace Bearer (who is properly called 'the Common Cryer and Sergeant-at-Arms'); these officers run the Lord Mayor's official residence, the office, and accompany him on all occasions (usually senior military officers with diplomatic experience). The Chief Commoner who is elected by the Common Councilmen alone and serves for one year; until recently chaired all of the Bridge House Estates and property matters committees but is now honorific. The Ward Beadles; responsible to a specific Ward from which they are elected, largely ceremonial support to their respective Aldermen, and also perform a formal role at Ward Motes. The City of London Corporation was not reformed by the Municipal Corporations Act 1835, because it had a more extensive electoral franchise than any other borough or city; in fact, it widened this further with its own equivalent legislation allowing one to become a freeman without being a liveryman. In 1801, the City had a population of about 130,000, but increasing development of the City as a central business district led to this falling to below 5,000 after the Second World War. It has risen slightly to around 9,000 since, largely due to the development of the Barbican Estate. As it has not been affected by other municipal legislation over the period of time since then, its electoral practice has become increasingly anomalous. Therefore, the non-residential vote (or business vote), abolished in the rest of the country in 1969, became an increasingly large part of the electorate. The non-residential vote system used disfavoured incorporated companies. The City of London (Ward Elections) Act 2002 greatly increased the business franchise, allowing many more businesses to be represented. In 2009, the business vote was about 24,000, greatly exceeding residential voters. An appointee of a qualifying body. Each body or organisation, whether unincorporated or incorporated, whose premises are within the City of London may appoint a number of voters based on the number of workers it employs. Limited liability partnerships fall into this category. Bodies employing fewer than ten workers may appoint one voter, those employing ten to fifty workers may appoint one voter for every five; those employing more than fifty workers may appoint ten voters and one additional voter for every fifty workers beyond the first fifty. Those who have worked mainly in the City for a total of ten years and still do so or have done within the last 5 years. Voters appointed by businesses who are also entitled to vote in a local authority district other than the City, due to their residence in that district, maintain the right to vote in their 'home' district. A map of the Wards as they were in the late 19th century. 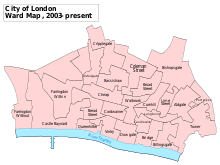 The City of London is divided into twenty-five Wards, each of which is an electoral division, electing one Alderman and a number of Councilmen based on the size of the electorate. The numbers below reflect the changes caused by the City of London (Ward Elections) Act and a recent Ward Boundary Review. There are over one hundred livery companies in London. The companies originated as guilds or trade associations. The senior members of the livery companies, known as liverymen, form a special electorate known as Common Hall. Common Hall is the body that chooses the Lord Mayor of the City, the Sheriffs and certain other City Officers. Wards originally elected Aldermen for life, but the term is now only six years. Aldermen may, if they so choose, submit to an election before the six-year period ends. In any case, an election must be held no later than six years after the previous election. The sole qualification for the office is that aldermen must be Freemen of the City. Aldermen are ex officio Justices of the Peace (JP). All Aldermen also serve on the Court of Common Council. The Court of Common Council, also known as the Common Council of the City of London, is formally referred to as the Mayor, Aldermen, and Commons of the City of London in Common Council assembled. The "Court" is the primary decision-making body of the City of London Corporation and meets nine times per year, though most of its work is carried out by committees. The Common Council is the police authority for the City of London, a police area that covers the City including the Inner Temple & Middle Temple and which has its own police force – the City of London Police – separate from the Metropolitan Police, which polices the remainder of Greater London. Each ward may choose a number of Common Councilmen. A Common Councilman must be a registered voter in a City Ward, own a freehold or lease land in the City, or reside in the City for the year prior to the election. The individual must also be over 21; a Freeman of the City; and a British, Irish, Commonwealth or EU citizen. Common Council elections are held every four years, most recently in March 2017. Common Councilmen may use the postnominals CC after their names. Each year, the Common Councilmen elect one of their number to serve as Chief Commoner, an honorific office which 'serves to recognise the distinguished contribution the office holder is likely to have made to the City Corporation over a period of years.' The Chief Commoner is expected to champion the Court of Common Council, to work to uphold its rights and privileges, and to offer advice and counsel to its members. S/he also represents the Court on various different committees, supports the Lord Mayor in the business of the Corporation and is prominently present on ceremonial occasions. The Chief Commoner is elected in October of each year and holds office for one year from the following April. Following a by-election in the Ward of Portsoken on 20 March 2014 the political composition of the Court of Common Council was 99 Independent members and one Labour Party member. Since City of London Council elections in March 2017, the council has been composed of 95 independents and five Labour Party members. In October 2018, the Labour Party gained its sixth seat on the Common Council with a by-election victory in Castle Baynard ward. The Lord Mayor of London and the two Sheriffs are chosen by liverymen meeting at Common Hall. Sheriffs, who serve as assistants to the Lord Mayor, are chosen on Midsummer Day. The Lord Mayor, who must have previously been a Sheriff, is chosen on Michaelmas. Both the Lord Mayor and the Sheriffs are chosen for terms of one year. The ancient and continuing office of Lord Mayor of London (with responsibility for the City of London) should not be confused with the office of Mayor of London (responsible for the whole of Greater London and created in 2000). Stuart Fraser, the Corporation's Deputy Policy Chairman wrote in 2011 "it is undoubtedly the case that we have more tradition and pageantry than most", for example the yearly Lord Mayor's Show. United Guilds Service involves all of the Livery Company Masters, the Lord Mayor, Sheriffs, the Aldermen and High Officers. This is the newest having been instituted in 1943, it is the responsibility of a special trust fund operating from Fishmongers' Hall (usually in March but so long as not conflicting with Holy Week). Tax journalist Nicholas Shaxson said, "Whenever The Queen makes a State entry to the City, she meets a red cord raised by City police at Temple Bar, and then engages in a colourful ceremony involving the Lord Mayor, his Sword, assorted Aldermen and Sheriffs, and a character called the Remembrancer. In this ceremony, the Lord Mayor recognises The Queen's authority, but the relationship is complex: as the corporation itself says: "The right of the City to run its own affairs was gradually won as concessions were gained from the Crown."" The City of London Corporation maintains around 10,000 acres (40 km2) of public green spaces – mainly conservation areas / nature reserves – in Greater London and the surrounding counties. The most well-known of the conservation areas are Hampstead Heath and Epping Forest. Other areas include Ashtead Common, Burnham Beeches, Highgate Wood and the City Commons (seven commons in south London). The Corporation also runs the unheated Parliament Hill Lido, in Hampstead Heath which the London Residuary Body with the agreement of the London Boroughs gave into the safekeeping of the City, for the benefit of the public, in 1989. The City also owns and manages two traditional inner city parks: Queen's Park and West Ham Park as well as over 150 smaller public green spaces. All these green spaces are funded principally by the City of London. The City of London has only one directly-maintained primary school, the Sir John Cass's Foundation Primary School (ages 4 to 11), which is also the only voluntary-aided Church of England primary school in the City of London. The school is maintained by the Education Service of the City of London. City of London residents may send their children to schools in neighbouring local education authorities (LEAs). Some secondary school children enrol in schools in Islington, Tower Hamlets, Westminster or Southwark. Children who are permanent residents of the City of London are eligible for transfer to the City of London Academy, Southwark, a state-funded secondary school sponsored by the City of London located in Bermondsey. The City of London Corporation also sponsors City Academy, Hackney and City of London Academy Islington. The City of London controls three other independent schools – the City of London School (for boys), the City of London School for Girls, and the co-educational City of London Freemen's School. The Lord Mayor also holds the posts of Rector of City University and President of Gresham College, an educational institution for advanced study. The Guildhall School of Music and Drama is owned and funded by the Corporation. Writing in The Guardian, George Monbiot claimed that the corporation's power "helps to explain why regulation of the banks is scarcely better than it was before the crash, why there are no effective curbs on executive pay and bonuses and why successive governments fail to act against the UK's dependent tax havens" and suggested that its privileges could not withstand proper "public scrutiny". In December 2012, following criticism that it was insufficiently transparent about its finances, the City of London Corporation revealed that its "City's Cash" account – an endowment fund built up over the past 800 years that it says is used "for the benefit of London as a whole" – holds more than £1.3bn. The fund collects money made from the corporation's property and investment earnings. ^ "The Heraldic Dragon". Sacred-texts.com. ^ "City of London Corporation elects new Policy Chairman". ^ The body was popularly known as the Corporation of London but on 10 November 2005 the Corporation announced that its informal title would from 3 January 2006 be the City of London (or the City of London Corporation where the corporate body needed to be distinguished from the geographical area). This may reduce confusion between the Corporation and the Greater London Authority. ^ "History and Heritage". City of London website. Archived from the original on 18 May 2013. Retrieved 13 January 2013. ^ "The Court of Common Council" (PDF). City of London Corporation. Archived from the original (PDF) on 12 June 2011. Retrieved 1 August 2010. ^ Lambert, Matthew (2010). "Emerging First Amendment Issues. Beyond Corporate Speech: Corporate Powers in a Federalist System" (PDF). Rutgers Law Record. 37 (Spring): 24. Retrieved 1 August 2010. ^ "Development of local government". Cityoflondon.gov.uk. Archived from the original on 3 December 2011. Retrieved 30 October 2011. ^ "The Corporation of London, its rights and privileges". Wattpad.com. 6 January 2007. Retrieved 30 October 2011. ^ "Corporation of London: Administrative history". The National Archives. Retrieved 1 August 2010. ^ "History of the Government of the City of London". Archived from the original on 15 August 2013. Retrieved 1 August 2010. ^ Sharpe, Reginald R., ed. (1899). Introduction. Calendar of letter-books of the City of London: A: 1275–1298. British History Online. Retrieved 28 May 2013. ^ "About the City". Cityoflondon.gov.uk. ^ René Lavanchy (12 February 2009). "Labour runs in City of London poll against 'get-rich' bankers". Tribune. Retrieved 14 February 2009. ^ "Cityoflondon.gov.uk". Archived from the original on 17 November 2012. ^ Example usage: interpretation clause in the Open Spaces Act 1906. ^ "Committee details - Court of Common Council". democracy.cityoflondon. City of London. 28 October 2017. Retrieved 28 October 2017. ^ "Police Reform and Social Responsibility Act 2011". Legislation.gov.uk. 26 October 2011. Retrieved 12 December 2011. ^ "Election results". Archived from the original on 25 September 2014. ^ "Your Councillors". 15 June 2017. ^ Thompson, Jennifer (24 March 2017). "Labour scores record win in City of London election". Financial Times. Retrieved 25 March 2017. ^ "Committee details - Court of Aldermen". democracy.cityoflondon.gov.uk. City of London. 6 November 2017. Retrieved 6 November 2017. ^ Fraser, Stuart (28 September 2007). "Response: The City of London is not above the law. Our elections are free and fair | Comment is free". The Guardian. UK. Retrieved 12 December 2011. ^ "Spital Sermon". St Lawrence Jewry. Retrieved 4 June 2018. ^ Shaxson, Nicholas (24 February 2011). "The tax haven in the heart of Britain". New Statesman issue, The offshore City. Retrieved 27 May 2016. ^ Ramblers. "Corporation of London Open Spaces | Home | Ramblers, Britain's Walking Charity". Ramblers.org.uk. Archived from the original on 12 August 2002. Retrieved 12 December 2011. ^ Ramblers. "Corporation of London Open Spaces". Ramblers.org.uk. Archived from the original on 29 October 2008. Retrieved 12 December 2011. ^ "Green spaces". City of London. Retrieved 27 July 2012. ^ "Management of our Green Spaces". City of London Corporation. Archived from the original on 17 February 2015. Retrieved 22 February 2015. ^ Monbiot, George (31 October 2011). "The medieval, unaccountable Corporation of London is ripe for protest". The Guardian. Retrieved 13 January 2013. ^ "City of London funds". City of London website. Archived from the original on 13 November 2015. ^ Rawlinson, Kevin (20 December 2012). "City of London Corporation to reveal details of £1.3bn private account". The Independent. Retrieved 13 January 2013. Wikimedia Commons has media related to Coats of arms of the City of London Corporation.